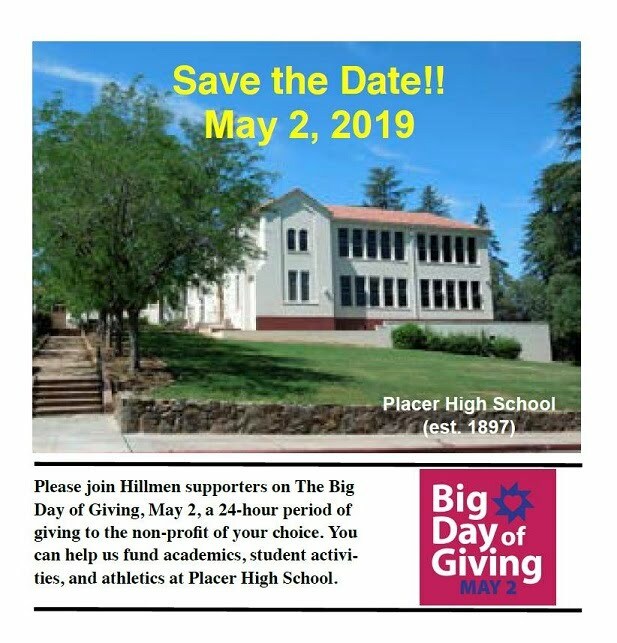 Placer High School supporters, please consider donating to The Hillmen Foundation during Big Day of Giving. The Foundation has granted more than $650,000 to Placer High programs in the past 30 years. Help us continue to support our students in the areas of academics, activities, athletics, and alumni endeavors. Friday, September 28th From 5:00-7:00pm Prior to the Rivalry Game of the Season Against Nevada Union! Come join us for the Hillmen Foundation's Tailgater on Friday, September 28th from 5-7pm at Central Square downtown Auburn prior to the game against long time rival Nevada Union. The $20 General admission includes food and a non-alcoholic beverage. Beer or wine drink tickets can be purchased for $5.00 each. There will also be a raffle for side-line seats for the game that evening immediately following the event. It's a great way to learn more about the Hillmen Foundation and their mission of enhancing academic, club and athletic programs at Placer. The dedication of a newly installed tile honoring founding Hillmen Foundation members Jug Covich and Tom Johnson will also take place. A special thank you to our generous sponsors including UAIC, Vina Castelano, Crooked Lane Brewery, Saucy Lito's, Recology, Collins and Collins Attorneys and Kahi Radio. The event is limited to the first 125 attendees. Please Note: A company on the Internet called AlumniClass.com has been soliciting Placer Alumni for $20 membership fees. This company is not affiliated in any way with Placer High School, The Hillmen Foundation, or any Placer Class Reunion or Placer Organization whatsoever. We suggest that you not respond to their emails or correspond with this company.